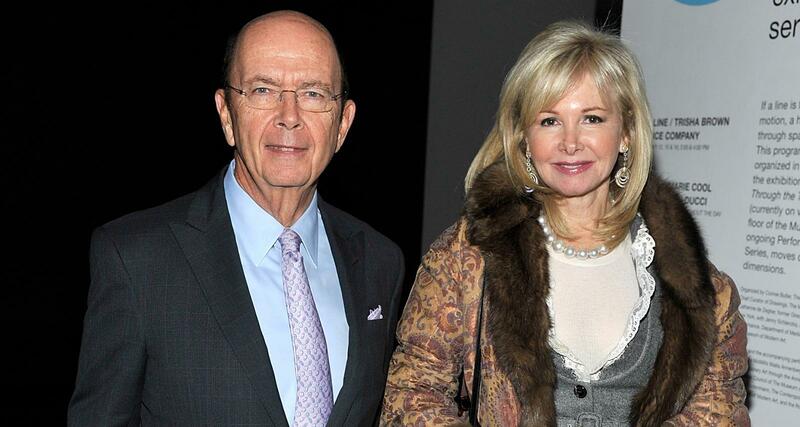 Wilbur Ross Jr., the U.S. Secretary of Commerce and private equity investor, is married to Hilary Geary, a well-known personality in New York’s social scene. She has many feathers in her cap and has also been a visible presence in politics since her husband joined the Trump cabinet. Our Hilary Geary Ross wiki turns the spotlight on this New York socialite. Born Hilary Somers Roche, she’s 67 years old and hails from a prominent family in New York. Her father, James Jeffrey Roche, and mother, Patricia Murray Wood, are both from New York’s elite. Her great grandfather from her mother’s side, Thomas Edward Murray, was an electric engineer and iconic inventor. He developed most of New York’s power plants and has over 400 patents to his name. He left behind a massive Southampton estate to his family. Her paternal grandfather was the famous novelist, Arthur Somers Roche. Her maternal grandfather was John F. Murray, a former commissioner of the Port of New York Authority. Her father was the editor of a New York-based publication, while her mother was a columnist for a Southampton publication. Her parents divorced and her mother remarried Wimbledon legend Sidney Wood. One of Patricia Murray’s sisters was married to a Vanderbilt. Another sister, Catherine Murray di Montezemolo, was a fashion trendsetter as an editor at Vogue. Geary graduated from Hewitt School and Finch College in New York. A true debutante, she was introduced to society in 1968 at the Grosvenor Ball as well as the Debutante Cotillion and Christmas Ball. Geary, who worked at Sens Unique Boutique at Alexander’s years ago, grew up in New York’s wealthy social circles. Her mother’s family had helped establish Palm Beach, Florida as a popular society resort destination. And coming from a long line of scribes, it’s no surprise that Geary also chose that path. The professional social swan began writing for Quest as a society editor, covering the wealthy party scenes of Florida and New York, of which she was also a part. She’s also written for New York Social Diary, which, like Quest, is also dedicated to wealthy society. Geary herself is famous as a hostess and has thrown lavish parties and fundraisers in New York, Florida, and recently in Washington, D.C.
She has authored two books on the wealthy personalities of the locales, New York, New York and Palm Beach People. The latter features interviews with Palm Beach millionaires/billionaires including President Donald Trump. The former Hilary Roche married John White Geary II in 1973. He was a founding partner of Ziebarth, Geary & Co., members of the New York Stock Exchange. John Geary was married and divorced twice before he married Hilary. He had three daughters from his previous marriage who were bridesmaids and flower girls in their wedding. They had two sons, John Geary III and Ted Geary, together. Geary II passed away in 1995. A widowed Hilary dated several prominent men, including Alfonse D’Amato, a former U.S. Senator and Wilbur Ross’ peer. She married British investment banker Peter Green, but that marriage didn’t last long. Wilbur Ross was previously married to Judith Nodine from 1961 to 1995. They share two daughters, Jessica and Amanda. His second marriage to former New York Lt. Governor Betsy McCaughey lasted from 1995 to 2000. Months before her first husband, John Geary II, passed away, Hilary attended a party hosted by Broadway producer Terry Allen Kramer in 1995. It was at that party that she first crossed paths with steel and textiles investor Wilbur Ross Jr. Back then, he was using his negotiation skills to work as a bankruptcy specialist for the Rothschild family. He was at the party with his then-fiancée, Lt. Governor Betsy McCaughey. At that time, Geary was more starstruck by McCaughey than Ross. Ross and McCaughey would marry later that year. Geary would go on to date a few other famous guys after her husband’s passing and marry Green before getting divorced soon after. She and Ross reunited at another party in 2002, where a mutual friend formally introduced them. They communicated via email and he accepted her invitation to a party she was hosting. They hit it off from there. She would go on to marry the (former) billionaire investor on October 9, 2004. Hilary Geary and Wilbur Ross are prolific art collectors. They reportedly have a combined art collection worth $125.0 million. They have lent some of their pieces to the Museum of Modern Art. Geary pulled him into the social scene, even bringing his fashion up to date, and together, they are a force in the charity scene. They use their partying and hosting prowess to raise money for various causes. They are part of the Boys Club of New York and the Central Park Conservancy, and have hosted soirees for both. They support local businesses in Palm Beach and are members of the Palm Beach Preservation Foundation, for which they have also raised money. Both Geary and Ross have been close friends of Donald Trump and his family for years. Ross, who was a Democrat for most of his life, registered as Republican in November 2016. Geary has been a Republican donor for years. Together, they donated thousands of dollars to the GOP campaign during the 2016 election cycle. When Wilbur Ross was appointed as Secretary of Commerce, the couple moved to Washington. They purchased a mansion worth over $10.0 million on Woodland Drive, famously known as “billionaire’s row.” The new residence now serves as a venue for the biggest soirees in the nation’s capital.